Cho was among hundreds of people from the two Koreas who were reunited with their families separated by the 1950-53 Korean War at the North’s eastern resort of Mount Kumgang on Friday. 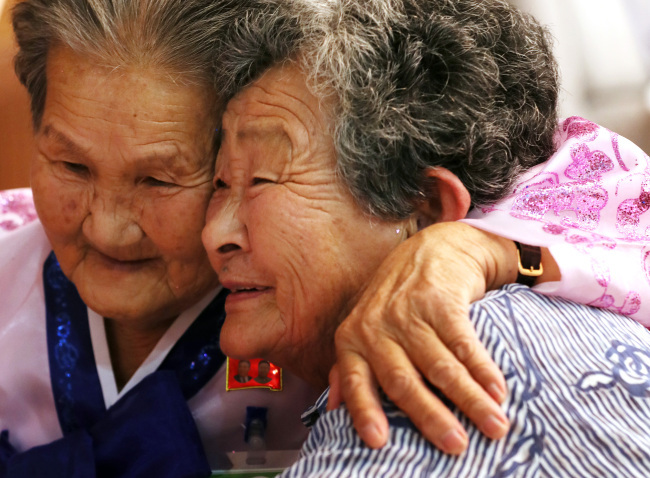 “I thank you for being alive,” Woo Gi-ju, 79, from the South, said fighting back tears as she met her 86-year-old sister, Gi-bok, who was in a wheelchair. The elder Woo had left her after saying she would go to seek an education. Kim Jeong-sook, 81, met her 85-year-old North Korean sister, Jeong-ok, who lost contact with her family after she went to the North’s eastern port city of Cheongjin to land a job. The reunions were held in line with the April inter-Korean summit agreement to “endeavor to swiftly resolve the humanitarian issues that resulted from the division of the nation” and proceed with reunion programs on the occasion of the Aug. 15 Liberation Day.